In 1965, Yale researchers discovered a map that was known to have been produced at least fifty years before Columbus’ first journey to America. The map, which showed Vinlandia Insula, the Island of Vinland or Newfoundland as it is known today, was part of a small medieval volume, the Tartar Relation. The Tartar Relation had originally been bound together with the Vinland Map and another medieval volume, the Speculum Historiale. 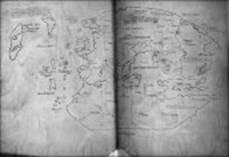 Wormhole alignments between the map and both volumes clearly showed that they had been all bound together at one time. The Tartar Relation volume was reliably dated by contemporaneous references to the Katatas people (Mongols) who dominated one end of the Eurasian land mass. There were also references to a certain bishop of Gada and Greenland that further corroborated the dating. The map was significant because it supported archeological finds of Norse landings in Newfoundland as well as medieval Icelandic chronicles, the Graenlendinga Saga and Eirik’s Saga. The map was chronological proof that by the time Columbus made his famous journey of discovery, some people in Europe clearly knew about North America. In 1972, Walter McCrone, who would later debunk the Shroud, examined some particles of ink and found titanium anatase, a material scientist discovered in the 1920s. He thus concluded that the map was a recent relic-forgery. Several people doubted McCrone’s conclusion including George Painter, the curator of ancient documents of the British Museum. In 1985, physicist Thomas Cahill, of the University of California at Davis, analyzed the map using a newly developed process, Particle Induced X-ray Emission, and found only minute traces of titanium anatase, amounts that were consistent with what would be expected in the common green vitoral ink of the 15th century. As with the Shroud, McCrone had found the substances that he claimed were there. They are there. But they are there in amounts too miniscule to support his conclusions. Columbus, who did not discover that the world was round, did not discover America ahead of the Norsemen. Yet, myths and doubts about the Vinland Map persist. Why? Because a scientist had proven it was a hoax and PBS television reported the results of McCrone’s findings. There was very little reporting about the Cahill’s later findings at Cal-Davis. Introduction to Carbon 14 Dating, History of Carbon 14 Dating, Archeological Successes, Making of a Catastrophe. There is little question among those familiar with the topic that the biggest mistake ever made in carbon 14 dating was the Shroud of Turin. Sadly, this mistake will be understood by some as meaning that carbon 14 dating is prone to error, subject to unexplainable anomalies or plagued by problems of contamination; none of which is true. Let's be perfectly clear: carbon 14 dating is an excellent and very accurate scientific method for determining the age of many things as old as 50,000 years. The failure to obtain a reliable date for the Shroud of Turin is not about flaws in carbon 14 dating methods or contamination. It is not about the problems, so often discussed in the media, of mysterious biological polymers growing on the cloth's fibers or new carbon introduced into the Shroud's cloth by a scorching fire in 1532. It is not about the sloppy work by three very prestigious carbon 14 dating laboratories. And it is not, as some suggest, about conspiracies dreamed up to prove religious or anti-religious arguments (the Shroud is a religious object for some). It is about a stupid mistake. Let me illustrate: Recently I sent a soil sample to a testing laboratory to find out why my lawn was doing so poorly. The lab reported back that the soil was perfect for grass. It had the right nutrients and the pH was right on target, neither too acidic or alkaline. I didn't think so. What had gone wrong? It turns out that a few weeks earlier I had repaired a spot in my lawn where my dog had peed and killed the grass. I dug out a small section of soil and filled the hole with loam I had purchased from a garden supply store. Without realizing it, I had taken a sample for testing from that repaired area. The sample was not representative of my lawn. It was chemically unlike the rest of my lawn. The lab had perfectly analyzed an invalid sample. Similarly, as we now know, from National Geographic News, PBS and several scientific papers, that the carbon 14 dating of the Shroud of Turin was done with an invalid sample. M. Sue Benford and Joseph G. Marino, with the help of several textile experts, undertook a detailed examination of the documentation photographs of the carbon 14 samples and identified clear indications of a medieval patch. Independently, Ray Rogers, a Fellow of the University of California, Los Alamos National Laboratory and a charter member of the Coalition for Excellence in Science Education has examined actual threads and fibers adjacent to where the samples were snipped. In a paper he published with Anna Arnoldi of the University of Milan, Rogers reported finding indisputable chemical evidence of a repair patch. He found dyestuff and spliced threads. Others, using scanning electronic microscopes and advanced spectral analysis tools have confirmed his findings. This mistake of using an invalid sample should not be allowed to tarnish the reputation of carbon 14 dating. Unfortunately, we live in a world of easy and careless polemics. There are some, as well, who because of religious convictions cannot accept the conclusions of carbon 14 dating. Scientists cannot properly challenge matters of faith on the basis of science alone. But it would be unfortunate if those who hold certain beliefs use an erroneous understanding about carbon 14 dating to challenge carbon 14 dating when it is not carbon 14 dating that is at fault. The mistake must now be openly admitted in the interest of scientific integrity. It was a careless mistake, a stupid mistake, a foolish mistake. Carbon 14 dating is an invaluable tool for archeology and science. The mistake made in dating the Shroud of Turin does not diminish this fact. 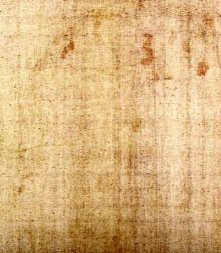 Face on the Shroud as it appears when photographed. This is the negative. Gum encrusted cotton fiber found only in the carbon 14 sample area and not elsewhere on the Shroud of Turin. Photomicrograph, gum is swelling and slowly detaching from the fibers and alizarin mordant lakes can be seen. Yellow dye is in solution. Phase-contrast microscopy of a single image fiber. Image is a reddish-brown caramel-like complex carbon bond, a chemical change within a super thin coating of crude starch on the fabric's outermost fibers. It is not paint or any kind of applied pigment. It is likely caused by bodily amine vapors reacting with saccharides in the starch. This is how the face appears on the Shroud of Turin. Second face image recently discovered with image analysis technology. This a a computer enhanced view. It matches the face on the front of the Shroud. The images are doubly-superficial meaning that nothing soaked through.